4-6 installed vertically in a standard 19″ server rack. 3M and Novec are trademarks of the 3M Corporation. Intel, Xeon and Xeon Phi are trademarks of Intel Corporation. InfiniBand is a trademark and service mark of the InfiniBand Trade Association. 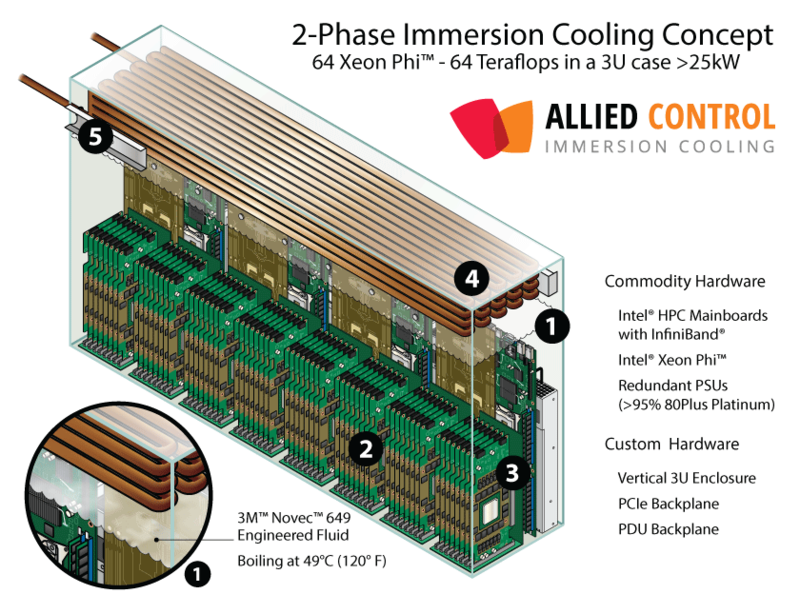 Allied Control designs passive 2-phase immersion cooling systems. What you see on the left is off-the-shelf HPC hardware, carefully arranged using 3D modeling. Let this be an inspiration of the density and energy savings possible by removing a couple of fans and heatsinks. Technically and physically, passive 2-phase immersion cooling is way ahead of air, water or oil cooling. With its elegant design (no fans, bulky heatsinks or other attachments), it costs less to build and less to run. This concept also works with GPUs such as NVIDIA Kepler, AMD Radeon Sky, and everything else. It’s a truly universal system. The hardware that maxes out 2-phase immersion cooling has yet to be built. To give you an idea, one could fill a rack size tank with a theoretical 2-3 Megawatt of electronics. While truly not possible today, tests have shown that 4kW can be cooled with 200cc of fluid in a volume of just 1 liter. Ourselves, we are building systems that can cool thousands of Watt of real-world electronics in just a few liters already today. 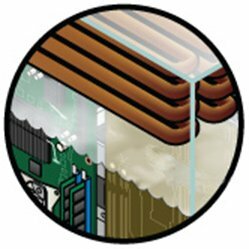 Immersion cooling systems get rid of duplicate hardware and transfer heat at the source. 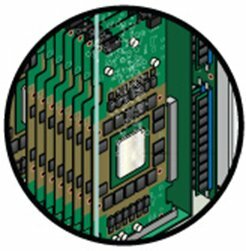 Eliminate dozens of heatsinks, fans, power connectors, cables, thermal grease, throttling and temperature sensors. Engineers save time and resources, end-users save money and maintenance overhead. 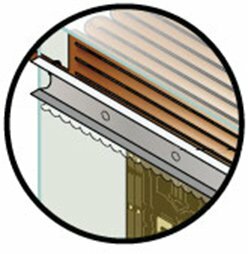 With air-cooled or water-cooled systems, the heat transfer hardware needs to be redesigned with every new generation of processors. Redesigning new heatsinks, fans, cold plates, heat pipes, cables and enclosures is a major waste of resources. 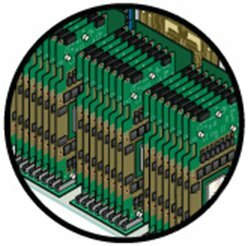 Immersion cooled systems are designed only once and will work with all your future hardware too. Out with the old, in with the new. In contrast to cold-plates, sealed blades, or custom water, oil and refrigerant piping, immersion cooled systems are truly universal & non-proprietary. Just as with standard racks or server enclosures, what goes in or connects to them is completely up to the end-user.